This is the SIM card slot allowing the iPhones sim card tray to be slid in and out of the logic board. 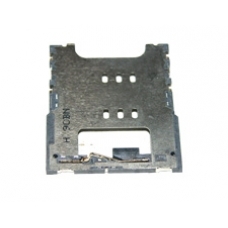 If you have for any reason damaged this part, the iPhone SIM tray will not slide easily in and out of the iPhone. The socket can easily be damaged if your SIM tray becomes stuck inside your iPhone, and too much force is used to remove the SIM tray. Please note that this can be a difficult home repair. * Requires Soldering to fit.